Yes, those are the legendary three monkeys! This was the first pool we encountered at the resort, and ironically turned out to be our favourite (and the last one we ended up in). While there isn’t any particularly special feature to the pool, there is a magically tranquil and peaceful atmosphere to it that makes it perfect for chilling and reading. When we were there, there were only a handful of people at any given time and it was relatively quiet compared to the other pools (there’s just something in the air!). We spent our last morning there (on these super comfortable lounge chairs under the shade), just chilling and reading, occasionally taking a dip when it got too hot (can you see how crystal clear the water is?). It was absolutely perfect and we could’ve stayed there all day! This is hands down the pool with the most amazing view. 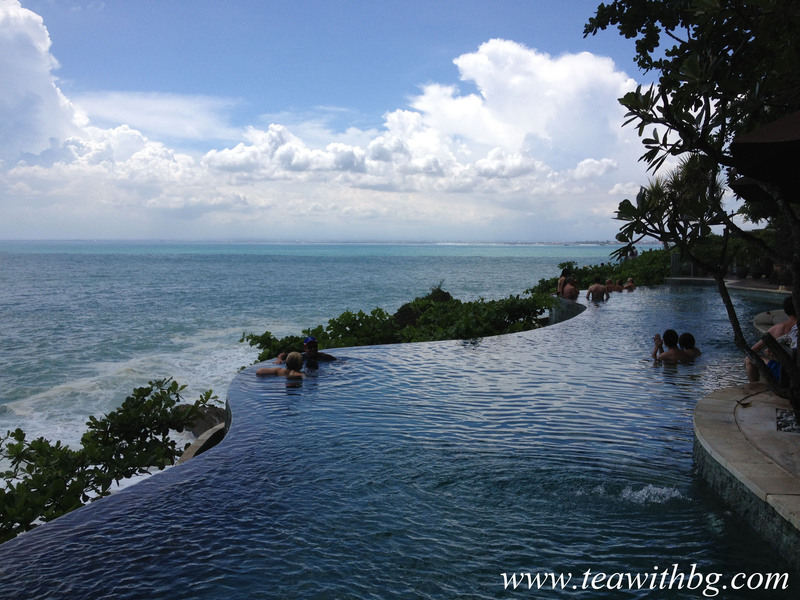 Located on the cliffs, this infinity pool is literally right next to the ocean. If you look down, you can see the waves crashing against the cliff. And if you time it right you can even see the sunset from here! I can just lie there and stare into the ocean all day… unfortunately we were not the only ones who thought so. By the time we got there around noon (it is quite a trek to get down to the cliffs! ), it was already packed – and no one looked like they were going to move anytime soon! The pool itself, sandwiched between the infamous Rock Bar and the Kisik restaurant, is actually very small and the water somewhat murky. Also because of the cliff, it does not get much sunlight earlier on in the day. I reckon that the best time to enjoy the pool is probably around sunset. That is if you are lucky enough to snag a place then. Come early! For those who came down via the side of the Kisik, leave via the Rock Bar. There is an elevator that takes you up back to the main pool area! HOT TIP: The best place to catch the sunset by the ocean at the Ayana is probably the Kisik Restaurant. But it gets packed fast. So book a place for dinner around the time of sunset on ARRIVAL at the resort (or earlier!). We tried to book on the day but was unsuccessful. In fact, book ALL your restaurants. You would think that it is a hotel and there will definitely be space. But it gets booked our very early on, and they are very stringent about it. One night we ended up sitting at the bar, even though there were a lot of empty tables around! On the other hand, this pool is also a very popular pool. Children are allowed, and they let them jump into the pool even though it says clearly that it is not allowed. But I guess children will be children. At least they are family friendly? Oh and the pool water at the Ayana in general is most definitely murkier than at the Rimba. I’m not sure if it is because there is more people here, or because the Rimba has a newer filter system. But anyway, this is another pool which you need to come early to snag a place for! A relatively quiet and good sized pool. 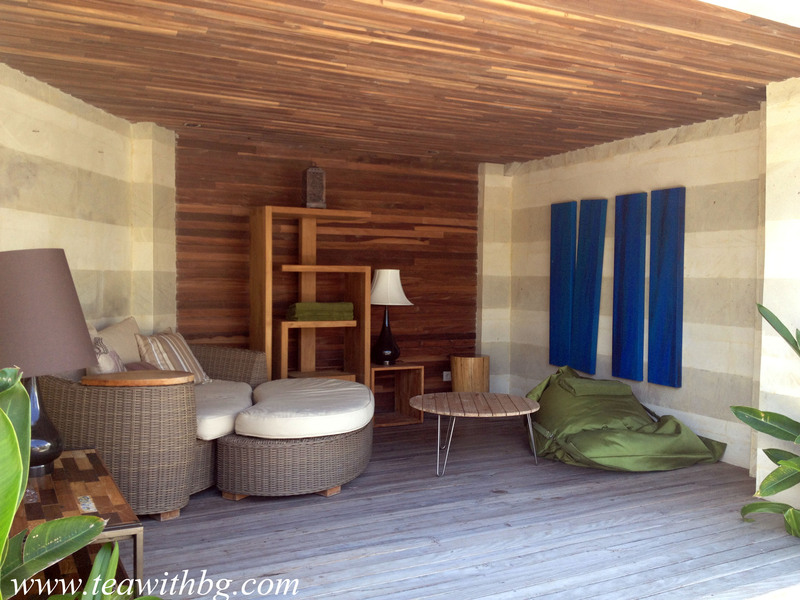 For those who want extra privacy and are super shy of the sun, they have these very cool niche/cabanas on the side under the Upper Pool for you to relax in. Each one is designed to be super comfy and welcoming. The only potential downside is that it is a bit too much in the shade, so you cannot see the sky and it makes us think that this is where the mosquitos are hiding. 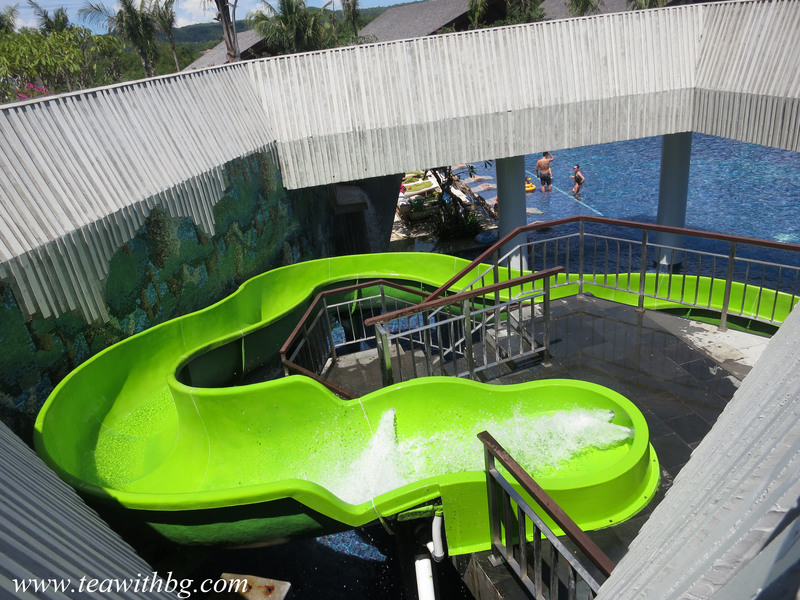 This is the main pool of the Rimba and it is super family friendly. It is huge, there is a water bar for food/drinks under the bridge, there are half submerged lounge chairs in the pool, it is very sunny and…. … there is a waterslide! Who doesn’t love waterslides? My only complaint is that I think the turn is a bit too sharp, and during my two times down the slide I inevitably hit my head/arm trying to complete the turn. 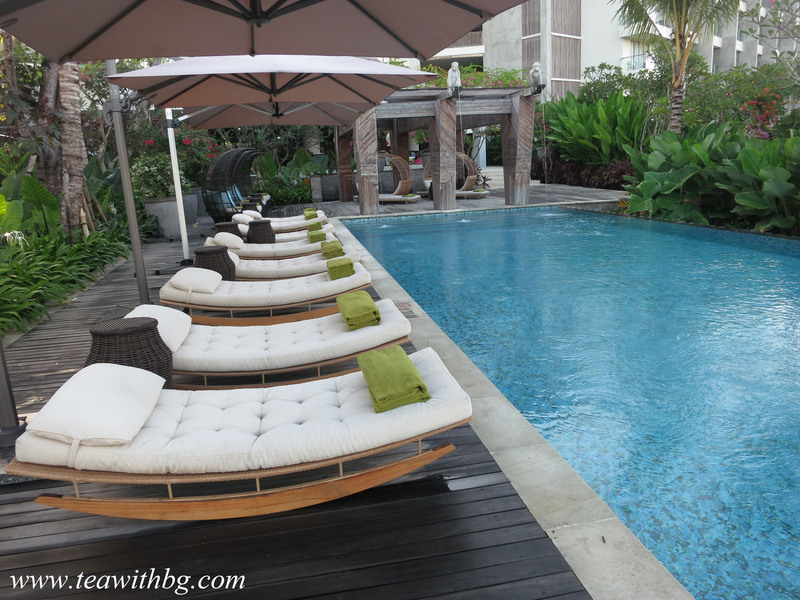 As the name implies this pool is located in the upper areas of the Rimba, so it generally gets a lot of sunlight. But what makes it best for tanning is the row of half submerged lounge chairs they have in the pool, which lets you tan without ever getting too hot! Genius! Of course I am hypothizing all this because I am of that camp that one should avoid the sun whenever possible. 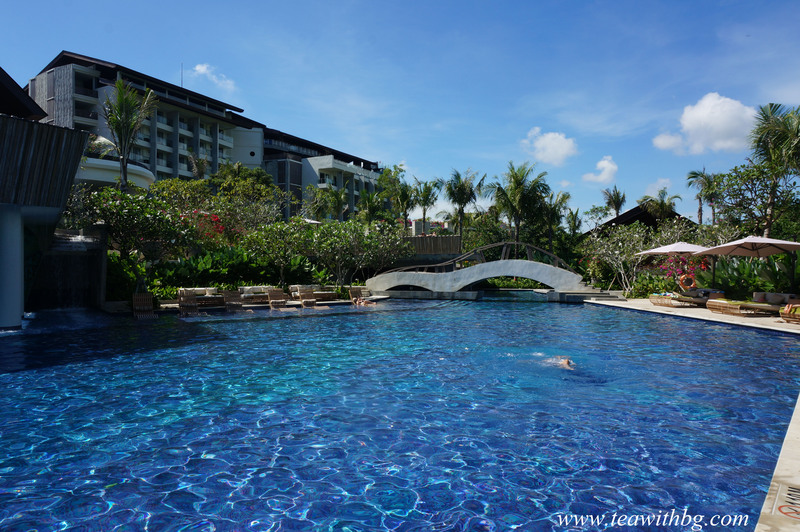 NOTE: This list does not include the Kubu beach, the River Pool and the Children’s pool at the Ayana, and the Lagoon pool at the Rimba, as we never made it there. Pool hopping is tiring business. 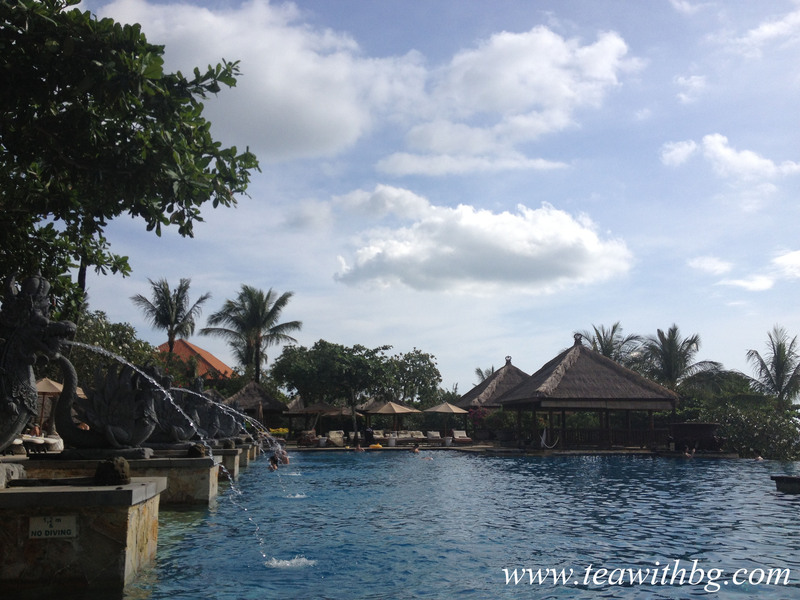 Part 1: Find out what the Rimba Jimbaran is really like here. Part 2: Find out whether the Ayana spa resort is worth it here. 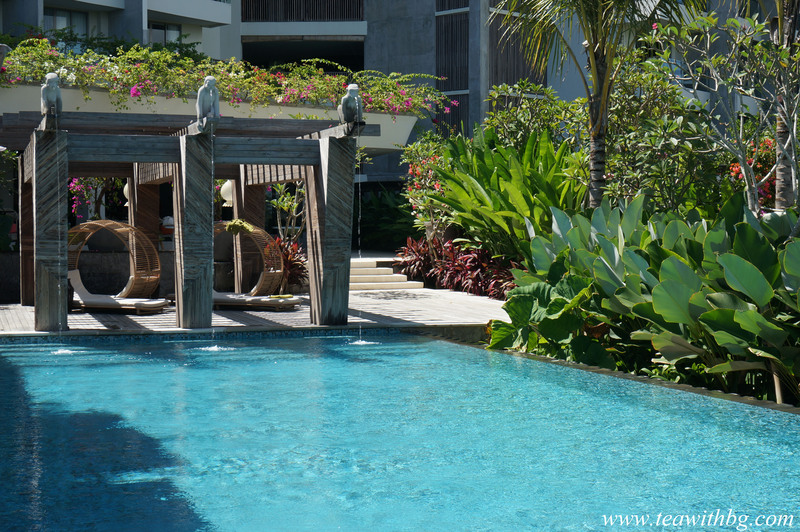 Part 3: Find out which are the best pools at the Rimba/Ayana here. The quick answer is a resounding YES. The prices are not exactly cheap, but for the quality of service and the overall experience, the Ayana spa it was most definitely worth it! We didn’t know it before we went, but apparently the Ayana spa is world famous, frequently listed on top spa lists globally. Indeed, we actually met a couple during our treatment who lived in another hotel an hour away, who came especially for the spa. We were so lucky that the spa is part of the Rimba/Ayana complex! The Ayana Spa is a standalone complex, located between the Rimba and the Ayana only a couple of minutes away by hotel tram. Despite being decorated in the more traditional Balianese style and being around for a long time (similar to the Ayana), it did not have as much wear and tear as we expected. We were actually pleasantly surprised to note that it was actually very clean and well maintained! The Ayana Spa has an extensive spa menu (be sure to check out the Special Offers section too). After much contemplation, we decided to go with the Exotic Balinese Experience, because we thought it was most comprehensive for the price (and also we were feeling especially generous after finding cheaper last minute air tickets!). It is a 6-hour package and includes 5 sessions, so we started right after breakfast at 10:30am. Traditional Lular: The first part of the spa takes place in a large private room, complete with a balcony, a shower a tub and of course a heated massage table. Mine even had a glimpse of the ocean! The traditional lular includes “a Javanese body masque and scrub, yogurt splash, flower bath, and a Balinese massage”. Basically they scrub you, lather you with yoghurt, let you wash off in the shower, and soak in the rose petal tub before giving you an amazing massage. The whole process takes about 2 hours, and it was absolutely divine. My only complain is that the massage part is too short. I could have used more of that massage. Jamu tea break: After the massage, they lead you to a tea house sort of area within the spa complex where you are reunited with your friends to enjoy a cup of Jamu tea. What is Jamu tea? Well according to google, it is a traditioanal Indonesian tea with healing properties. I personally didn’t try it, but it looked orangey with a lot of spices. A little like curry. A choice of tea would have been nice. At this point, we were also confused as to where we are supposed to go next. Even though they handed us a schedule, a little more guidance would have been appreciated. It’s a good thing we are so proactive! Indonesian cooking class: After tea, we changed and were driven to the Padi (Ayana’s Thai restaurant) for our cooking class. We were greeted with fresh guava juice and our very our own packages, which includes a chef’s hat, an apron and a booklet of the recipe we were going to follow. To be honest, participation is optional and is entirely up to how much you want to actually cook( i.e. from none like me to super hands on). The chef and his assistants were super nice and friendly, and went out of their ways to make us feel comfortable. We really appreciated the fans they brought out for instance, cause even though it is an open kitchen it was still super hot! It was a fun side activity from spa-ing. Though to be honest, this is probably something I would skip next time. I’d much rather be lounging somewhere. Aquatonic Seawater Therapy Pool: Located within the spa complex, the Aquatonic Therapy Pool is a semi outdoor pool (under a thatched roof) with a distant view of the ocean. When I first read about it, I thought it was just some Balinese type of hot spring, but it is actually a 2 hour water pressure massage session (the water is actually comfortably warm). To warm up, you walk through a pebbled path and swim across countercurrents. You then start a series of water pressure massage aimed at different parts of the body, starting with the leg and moving towards the rest of the body (it is incredibly thorough). Every 2 minutes, guests are then asked by staff to rotate to the next spot (like musical chairs). All the while, you can chat with your partner/friends and enjoy the ocean view. It is not all dandy though. The pressure of the water varies, and some of it can be downright painful – my friend ended up with bruises on her back (though she really enjoyed it!)! I personally skipped a few of them, but overall it was definitely an awesome experience. 25-minute Aqua Relaxation Massage: Once our skin was properly pruned, we were led to the other heated pool on the side for our aqua massage. I had no idea what to expect. Turns out they use 2 pool noodles – one under the head and one under the knees- to float you face up (obviously) in the water. The masseuse then takes your hands and legs and gently moves you around the water, letting the water pressure do the work. The feeling is quite surreal. I felt like I was a water nymph dancing in the water world and I loved it!!!! I highly recommend it. But remember to relax and not move around on your own, otherwise you’ll disturb the equilibrium and drown yourself! Our session ended in the late afternoon, and we all felt completely refreshed and at peace afterwards. The only thing that could have made the session even better was to skip the tea, and shorten the cooking class, and extend the massage instead. I highly recommend the Ayana spa and cannot wait to be back! What better thing to do on a rainy night than to recall more sunny ones? Oh Bali, it has only been a few weeks, but how I’ve missed you. Distance to airport: It is a short half hour ride from the airport, which is a major plus. A year ago when I went to Bali for the first time, I discovered that they do not have any highways, and ended up stuck in traffic for more than an hour before arriving at my resort (near the Tanah Lot temple). So this time I wanted to be as close to the airport as possible to minimize travel time. Though I’m told by the driver that they recently did indeed built a highway and traffic is slightly better. Incidentally, Seminyak is about 30-45 minutes away depending on traffic. Oh and on a side note, the airport is MUCH improved since a year ago. All shiny and new!! On a side note to the side note, did the immigration officer ask anyone else for tips? We thought it was highly unusual. Shiny and new: Speaking of shiny and new, the Rimba is shiny and new as of last November. We figured that April is a good time to go. It gives the hotel time to work out the kinks, but still allows you to enjoy the newness. Multiple pools: Travelling in easter, we were worried that the pools would be overly crowded and noisy with children. The fact that the Rimba had multiple pools (and access to the Ayana pools) was a major plus. Access to the Ayana: One major minus for the Rimba is that it does not have a sea view. This is important because.. well its Bali. It is one of Bali’s key selling points. Instead, the Rimba is located on top of a mountain (or hill? ), overlooking a forest (the name means forest I think). Luckily for Rimba, guests also have access to its sister hotel, the Ayana, which is located right next to the sea, and has a private beach. There’s even priority access to the infamous Rock Bar (even though we did not end up going)! Ayana also has a world renown spa and lots of restaurant choices (the Rimba only has 2 restaurants). There is a tram that goes back and forth the hotels, which is very frequent. The two hotels are literally 3 minutes away from each other. Great reviews: To be fair, the Rimba does not have that many Tripadvisor reviews yet. But the majority of them were great, commenting on the excellent service and helpfulness of the staff, and what a great hotel it is in general. Compared to some of the other reviews I’ve read during my research (i.e. Sofitel, which is also a new hotel), Rimba’s reviews were encouraging. Value: Compared to the W Hotel, the Seminyak, Le Meridien, Conrad and the Sofitel , the Rimba (being a newly hotel I guess?) is also relatively affordable. It came out to be in the high/mid-range in terms of pricing out of all the hotels we considered. Taking all these things into consideration, the Rimba Jimbaran presented the best value in all areas for us – and we were not disappointed. We had an absolutely fabulous time, and only wished that we could stay longer. I would definitely recommend it to friends! There are so many things to say about the Rimba that I don’t even know where to start. So I figured I will go chronologically. Airport: Our flight arrived in the late afternoon. We debated whether to use the VIP pick up service (because of possible crowds/lines over easter), but in the end elected not to use it. We were not sure how much added value it would be, besides possibly avoid being asked for tips by the immigration officer (and potential repercussions). Besides, don’t they need to match our faces to our passports? As it turns out, the lines were not that bad, even though I had to get on the ground visa (perhaps about 20 minutes in total?). Once we got out, we easily spotted the staff from Ayana/Rimba, and were escorted to our car. The drive to the resort was a smooth 30 minute ride. Welcome: We arrived at the hotel at around 6pm, and were greeted by staff with our welcome orchid necklaces. Upon stepping foot in the lobby, we were momentarily distracted by the modern decor and the amazing view of the last of the sunset. There are two front desks on either side of the lobby, and to this day I’m still not sure if they are the concierge or reception (or both?). All the staff were busy with guests though, and we waited around for more than 10 minutes before we were able to check-in (there are no clear lines as to where one should line up). It was only when we were checking in that they realized that they had forgotten our welcome drinks and towels. Having said that, the drink was delicious and very refreshing. Some kind of rosemary lemonade. We selected the Jimbaran Bay Rooms, because we hear that the regular rooms face parking lots, and worried that there will be no privacy at the pool access rooms (we would probably have to keep our blinds down all the time). Sound proofing: Our rooms are conveniently located a few doors down from the lobby. I thought it was great – less walking! But I quickly learnt that night that it was also its downfall. I have read similar reviews before, and I can now confirm that they are indeed true. The walls are paper-thin. You can hear EVERYTHING – people walking past at night, talking and laughing. Children shrieking. I can even hear my friend laughing next door! Needless to say, sleep was not exactly restful – and my beauty sleep is important! This is a major minus. But to be fair, this is already the biggest complaint of just a few other nit picky things about the room. Room design: Back to the room, it is modern, clean and chic, designed in neutral earth tones. Slightly on the smaller side (given that it is in the middle of a forest, you would think they could be more generous with sizing), but still comfortable with a small sofa/sitting area, a desk and a balcony. There’s even a neat bench on one wall, which I thought was perfect for suitcases. I thought that the marble floor (vs. carpet) was also very appropriate given that we will likely be coming in from the pool a lot. Technology: Technology wise, it was well equipped with iphone docks, flat screens etc. On the other hand, the lighting was a bit on the dark side. Indeed, the whole resort was on the dark side at night. We ended up sleeping very early every night, which I guess is a good thing. My friends also had trouble with their TV, which apparently took forever to fix (I never tried mine). Oh and the phones are kind of old school. Bathroom: Having examined many tourist pictures prior to the trip, I was slightly surprised by the bathroom. It is much smaller than I expected. No wonder everyone always post pictures of the circular tube. It literally dominates the room! Having said that it is very nice, it serves as both a bath and a shower, with a lovely rain shower overhead. But the rest of the bathroom is minimal, with barely enough counter space. There were also random chinks in the sink and bathtub, even though the hotel is new (perhaps ceramic is not the best idea after all). The hairdryer was also dismal. It took forever for my hair to dry, and many nights I just left it half-dried. Miscellaneous: Just to be nitpicky, I would also like to comment on the hotel provided slippers and robes. I love hotel slippers (my favourite being from MO Paris! ), and love the feeling of the lush robes. Sadly the ones provided by the Rimba fell below expectations. They are both made in a black and brown Balinese print. This is fine and all, but it makes me wonder if they are clean. The robes are thin and not lush at all. But most shocking was that I swear the slippers are re-used! They felt somewhat damp. I ended up wearing my flip-flops indoor instead. The next morning, we were also happy to find that we have a spacious balcony with a great view of the pool! If the pool side wasn’t so nice, this would’ve definitely been an ideal option to sit and read at. Conclusion and tips: I would give the rooms a 4.5/5 stars, and suggest anyone going to request a pool facing room that is on the upper floors. It was overall great, with the exception of a few kinks and the noise issue. I have more to say about the hotel facilities, restaurants and the spa. But I think I will save that for another post.